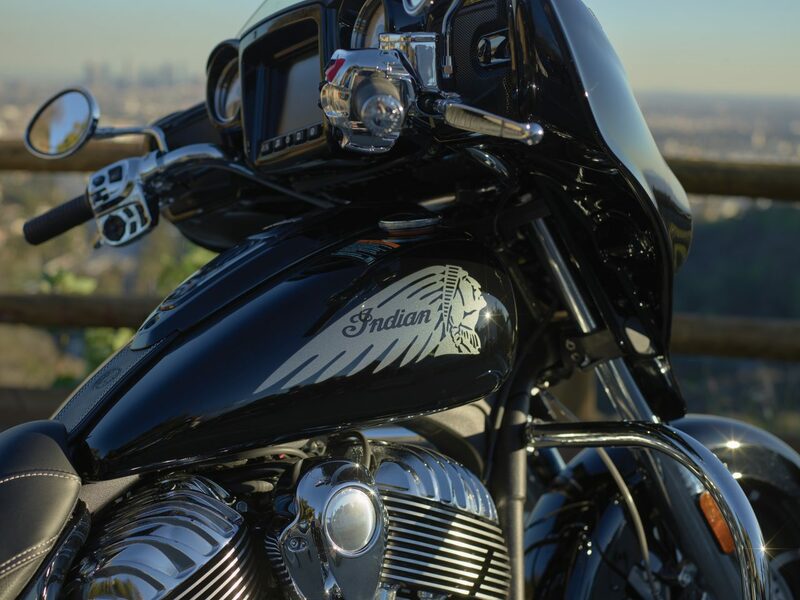 Indian’s new Chieftain Limited represents a bold evolution of the Chieftain line and paves the way for even more legendary rides. Indian Motorcycle’s designers have added just the right amount of style to give the Chieftain a sleeker look than ever before. 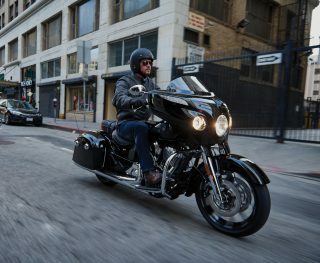 As well as the Chieftain Limited, there is also a Chieftain Elite (a even more exclusive version with a special paint finish – announced in a separate press release). 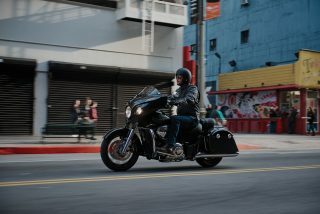 The main visual changes of the Chieftain Limited compared to a Chieftain include a sawn-off front fender and a new ten-spoke 19″ front wheel and 16″ rear wheel, which quickens up the handling. The front wheel has dual 300mm floating rotors with four piston calipers and an Indian logo embossed on it. 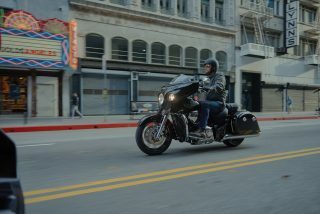 There’s also a colour-matched headlight bezel and a more streamlined leather saddle to complete the sleeker look. 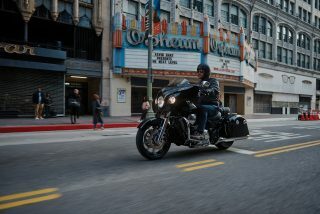 Along with the Ride Command seven-inch infotainment system and the powerful Thunder Stroke 111 engine, the Chieftain Limited has a keyless ignition, anti-lock brakes (ABS), a 100-watt audio system, chrome front highway bar, a power adjustable windshield, remote locking hard saddlebags and just enough chrome to highlight all that this bike has to offer. 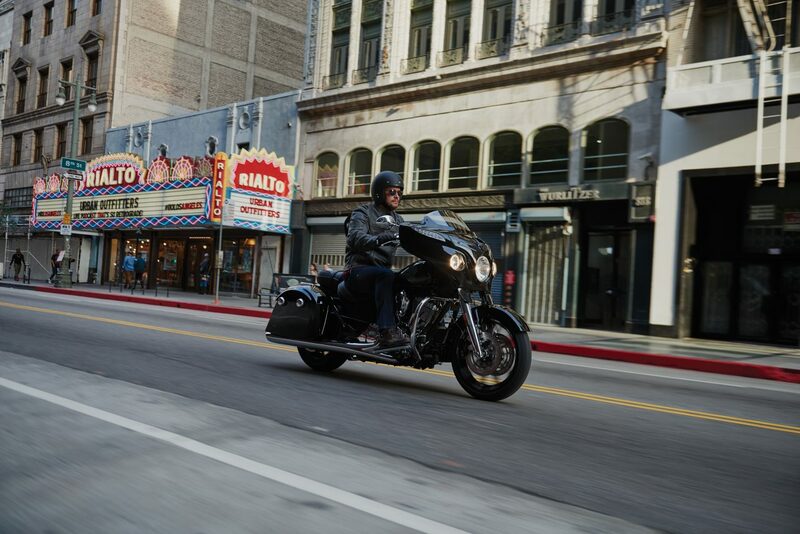 The new sawn-off front fender gives the bike a more streamlined look. It also shows off new wheel and dual front brake rotors and caliper. 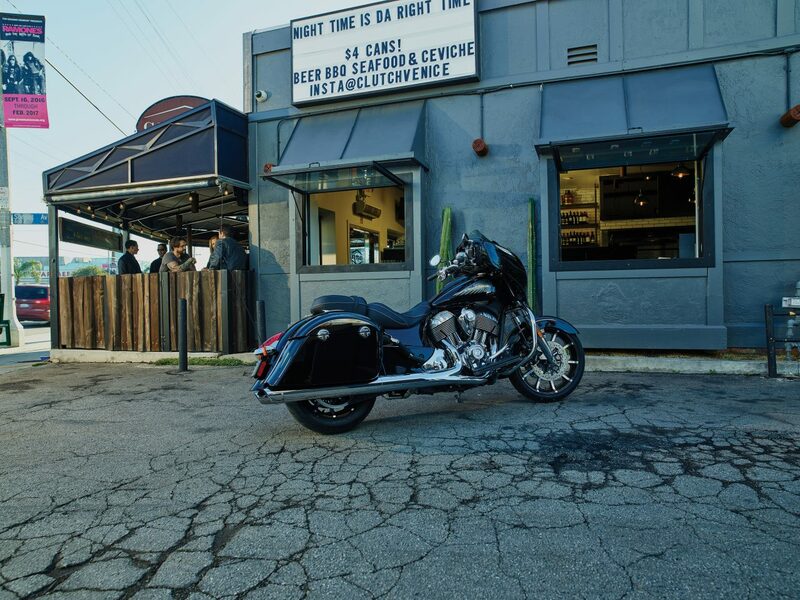 It also offers a subtle nod to Indian’s ‘open’ fenders of the 1920s and 1930s. The 19″ beast of a front wheel features a 10-spoke design. The Chieftain Limited has subtle accents that collectively give the bike its sleeker style. Making the colour of the headlight bezel match the fairing is a simple change, but one that makes a big difference to the looks. 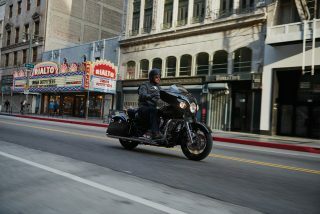 The rider and passenger seats are also contrast-stitched to make it stand out. 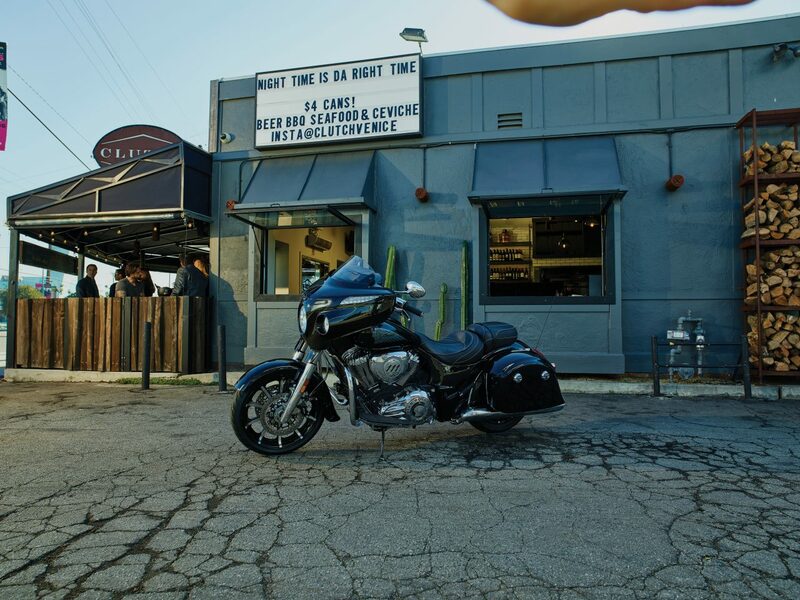 Indian Motorcycle’s Thunder Stroke 111 V-Twin engine serves up a tasty 135Nm of torque so you can accelerate hard in every gear and have power to spare. Pinch. Swipe. Tap. All without removing your gloves. Offering the industry’s largest, fastest, and most customizable infotainment system, the seven-inch Ride Command system allows you to get turn-by-turn directions, quickly navigate top points of interest, play Bluetooth audio, check vehicle information and status, plus a whole lot more via its easy to use interface. And thanks to split- screen technology, you can easily customize three rider screens to display the information that matters to you most. Two speakers located in the fairing deliver 100-watts of power at crystal clear quality. 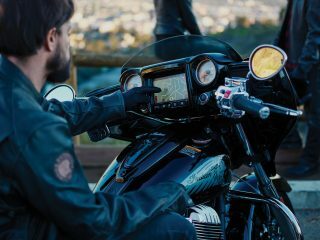 Use Ride Command to switch between the AM/FM stereo, Bluetooth or USB input, giving three different ways to listen to music as your ride. Put the Chieftain Limited key fob in your pocket then just climb on the bike, push the ignition button and ride. If you misplace or lose your fob, use can enter an individual security code pre-programmed into the ignition to start it up. The front wheel is adorned with powerful, dual 300mm front rotors with 4-piston calipers. For a custom touch, the caliper housings feature the Indian Motorcycle script logo. 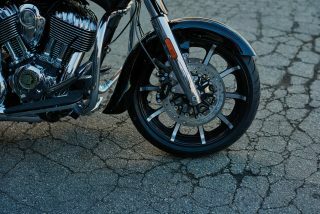 The rear wheel features a single 300mm floating rotor with 2-piston caliper to ensure that you can come to a halt quickly. 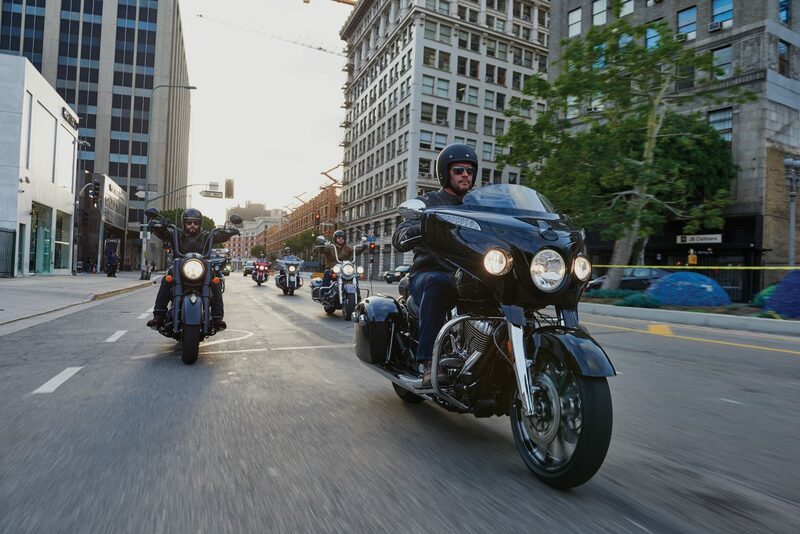 An advanced anti-lock brake system (ABS) lets you ride with confidence and helps you stop with greater control. With a commanding power-windscreen and remote lockable hard saddlebags you’re ready to rack up the miles in style and comfort. 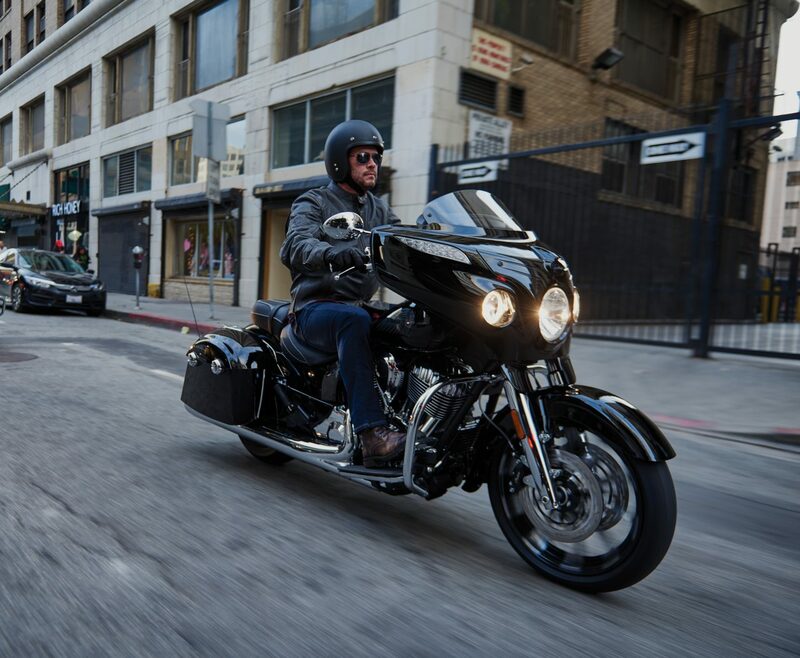 A tyre pressure monitoring system (TPMS) and cruise control enhances your ride during highway cruising. The Thunder Stroke 111 engine produces a rich, deep exhaust rumble from the exhaust. Which was acoustically engineered to eliminate high-pitched sounds, so what you really hear is Indian Motorcycle thunder. 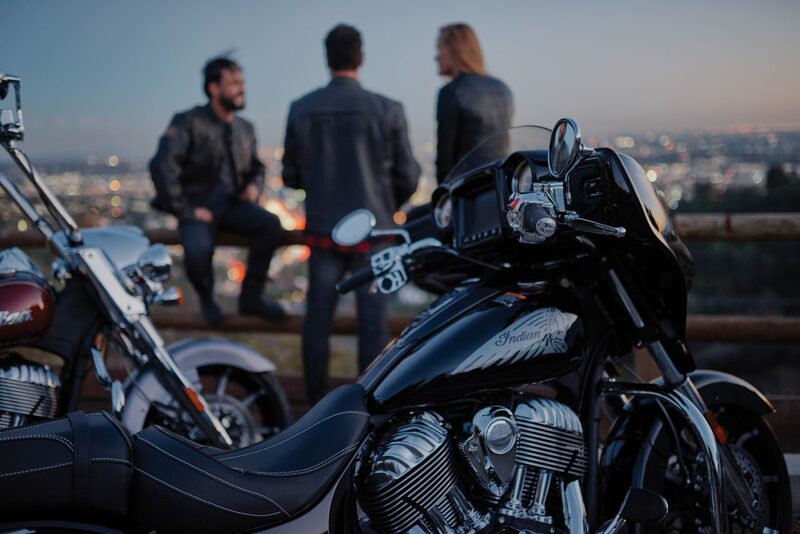 Add the following blacked-out accessories to unleash more power, improve throttle response and add a rich and throaty exhaust note – Stage 1 Exhaust, a Thunder Stroke High Flow Air Cleaner and Stage 2 Performance Cams. 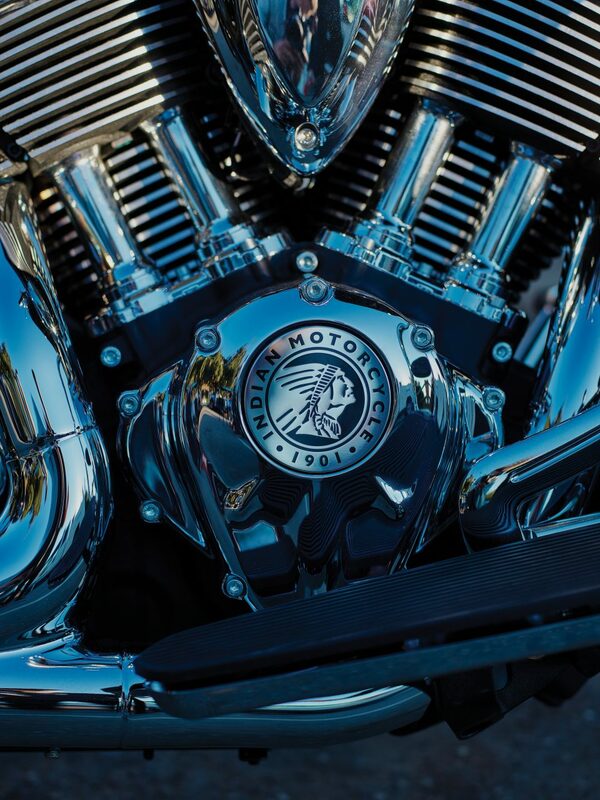 For ultimate style, add Fish Tail or Six Shooter exhaust tips. (Note that accessory stage kits are not available in all markets. 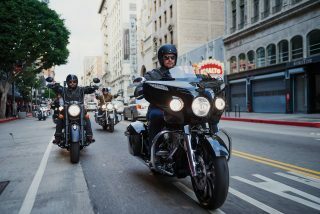 All riders must obey local laws). The blacked-out Mid Rise Handlebar Kit gives you a comfortable reach to the controls. Treat yourself to an additional 100-watts of sound by fitting speakers in the saddlebags (Premium Saddlebag Audio). 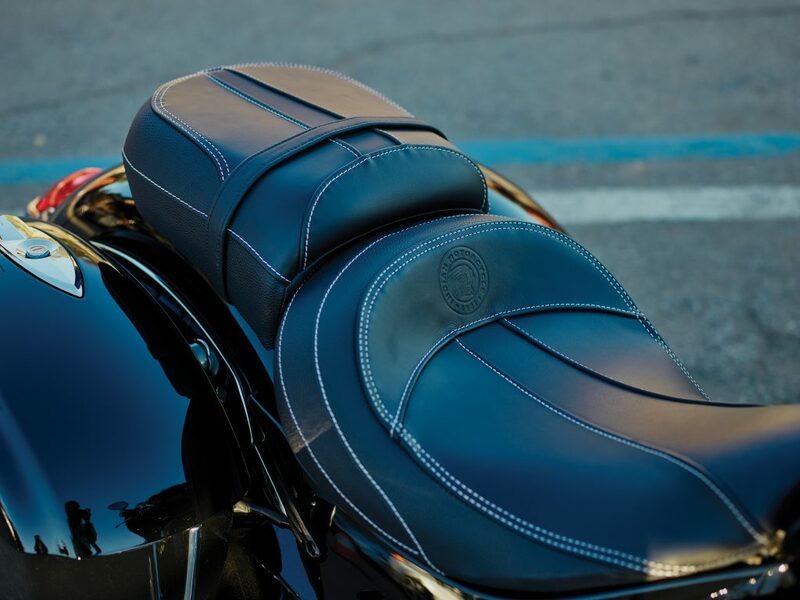 You’ll also need the colour-matched Saddlebag Audio Lids (sold separately). 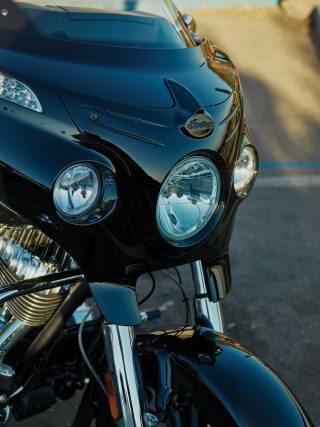 Switch to all-black Floorboards and install black Fender and Saddlebag Trim to replace the stock chrome pieces. A black Front Highway Bar adds black custom style, tip-over protection, and a comfortable perch for your feet when cruising. 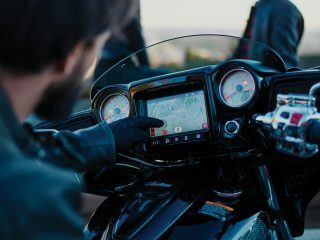 Ride Command customisable infotainment system featuring: Map/Navigation with pinch-to-zoom and swipe, Bluetooth compatible audio, Vehicle Status, Vehicle Info, Trip 1, Trip 2, and Ride Data. 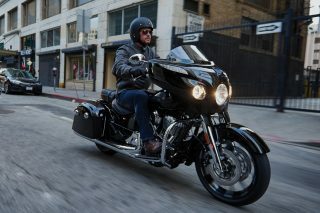 Keyless ignition, electronically adjustable windscreen, heated grips, dual-stage heated seats, cruise control, ABS and TPMS. 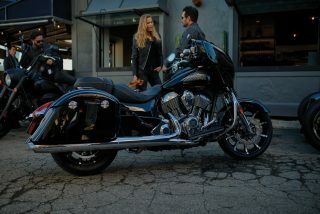 As its name suggests, Chieftain Elite, has extra special touches over and above the Chieftain Limited model. 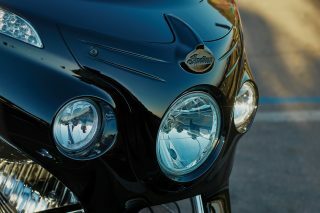 These include a special paint scheme (hand-painted), rider and passengers floorboards made from billet, a flared power windshield and the addition of saddlebag speakers.